Black business leaders in the Boston area, like developer Richard Taylor (left), have suggested that with significant work, the city’s culture could change. They were part of a forum, organized last week by the Black Economic Council of Massachusetts, at the Federal Reserve Bank of Boston. Artists of color have pushed to create in the Seaport District a “black space” that welcomes all to infuse the overwhelmingly white enclave with diverse cultural offerings. The head of a suburban senior softball league, with some 400 players, has reached out to black and Latino leaders to help diversify its roster. 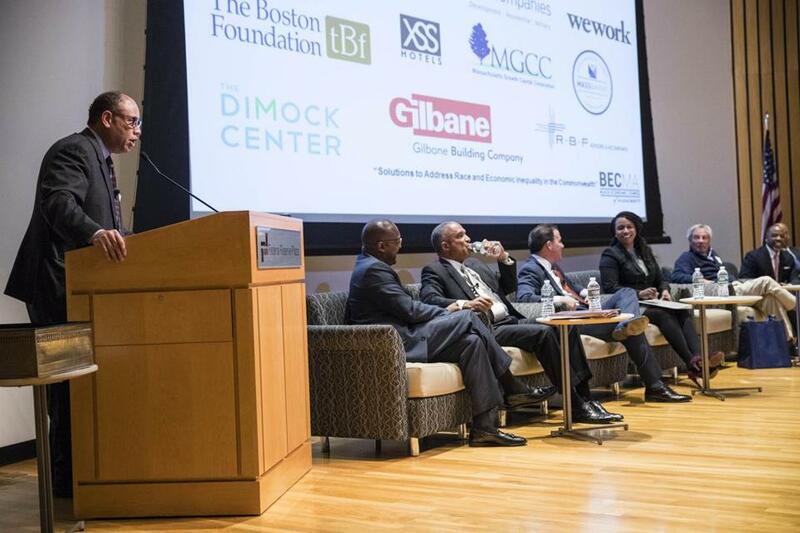 And at the Federal Reserve Bank of Boston this past week, two longtime construction executives – one black and one white – shared a stage before more than 300 people to discuss how their unlikely partnership could be a model to help bring equity to a city long beset by racial injustice. The artists, softball players, and business leaders all cited the Globe Spotlight Team’s seven-part series on race published in December as the impetus that pushed them to act, reach out, and organize. Reporters have also been invited to take part in more than 40 forums across the region, while other events, including at hospitals and businesses, have been internal employee meetings about a topic that is often taboo in Greater Boston. Some black leaders, like developer Richard Taylor, have suggested that the region has hit a new inflection point. With forced busing in the 1970s an increasingly distant memory, they say, Boston may be poised for major changes, which will help it break free of its enduring national image as a place unwelcoming to blacks. A Facebook group called “Discussing Race in Boston” with 3,600 members has, among other things, spurred nearly two dozen meetups. People have gathered to talk about race over a potluck dinner in Waltham, at a Cape Verdean restaurant in Dorchester, and at a Panera Bread café in Newton. Organizers say at least seven other new meetups have been scheduled in Roxbury or Dorchester, Quincy, Hyde Park, and beyond. 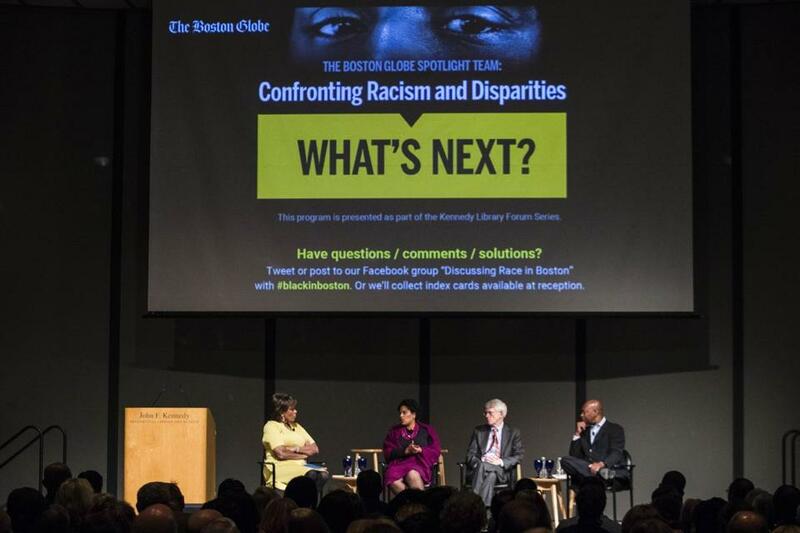 Liz Walker (left) spoke with NAACP Boston Branch President Tanisha Sullivan, Massport CEO Tom Glynn, and developer Darryl Settles during a panel discussion focusing on The Boston Globe Spotlight Team's series on race at the JFK Memorial Library in Boston on Feb. 27. The Globe series, which relied heavily on data and hundreds of interviews, found that while Boston has become a more tolerant city, black residents still face systemic inequities in wealth, opportunity, and power. Forums to discuss the series have been held at high schools, architecture firms, universities, civic associations, and law firms. An audience of about 200 last week attended a discussion on race at Trinity Church. A few days later at the advertising firm DigitasLBi , roughly 80 employees gathered with pizza for a lunchtime panel about the series. Spotlight Team members will be at this coming weekend’s “Hack for Inclusion,” an event to combat bias led by students at the MIT Sloan School of Management and the school’s Black Alumni group. The DigitasLBi was spearheaded by Melanie Liu, who grew up in Miami and felt the sting of racial isolation when she moved to Boston. The series resonated with her experience as an Asian-American woman, Liu said, and the ensuing discussions, including in the Facebook group, have showed her an unexpected side of the city. She had thought Boston’s progressive reputation was rooted in the large population of college students and young professionals. “There’s a significant number of white allies out there that are much older who are willing to fight for me as a woman of color and to celebrate progress,” said Liu, who is 25. The push for a black cultural space in the Seaport came after a black violist remembered the headline that the newest part of Boston was “whiter than the old.” After a Facebook post and a flurry of text messages and meetings, a group of artists of color launched an initiative called Cross Cultural Collective or C3. The collective is one of eight entities that has submitted proposals to lease 13,000 square feet at 50 Liberty Drive on Fan Pier that the developer was required to make available as a cultural or civic space. C3’s plan includes black art exhibits, performances, workshops, a culturally attuned café, and more. “The best way to bring cultures and people together and begin breaking down barriers is through art,” said one of the organizers, Tiffany Cogell. A similar desire prompted Rob Mitchell, commissioner of EMASS Senior Softball, to begin a diversity effort in his league that plays predominantly in Framingham and Wayland. “Recognizing that diversity doesn't happen by accident or because of good intentions, we have taken the recent Globe series as a call to action to be part of change,” he wrote in an e-mail. The Globe event at the Kennedy Library also included Thomas P. Glynn, chief executive officer of the Massachusetts Port Authority and Boston NAACP President Tanisha M. Sullivan. The moderator, the Rev. Liz Walker spoke about the Globe’s data-focused reporting, but said the impact of racism is about more than numbers. Sullivan said she knows that pain all too well, but said the dialogue must continue. Andrew Ryan can be reached at acryan@globe.com. Follow him on Twitter @globeandrewryan. The series can be found at www.globe.com/race.